Today tenkara, Tenkara USA (or, in this case, Tenkara International) and Patagonia once again crossed paths. This time in Japan with staff from a couple of Patagonia stores in Tokyo. At the moment, I am sitting in my tatami room in the town of Kaida Kogen, Nagano prefecture in Japan. We just finished a hot-pot dinner, which topped off a day of teaching tenkara to four Patagonia-Japan employees. Over the next couple of days more people will join the tenkara class. 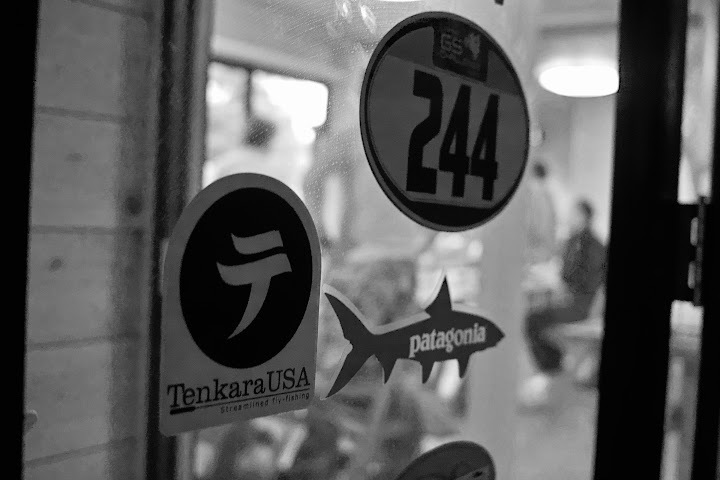 As I learned today, employees from different Patagonia stores in Tokyo have formed an informal “Patagonia Tenkara Club”, which currently has about a dozen members. It’s serendipitous that very soon after I started Tenkara USA, I discovered Yvon Chouinard, founder of Patagonia, had recently become a tenkara convert. Especially given the fact that Yvon’s book, Let My People Go Surfing, was one of 2 books that inspired my business, and the one I used as a guide on developing of my own business philosophies…. And, soon after that, Yvon wrote and article for Fly Rod and Reel magazine titled “Simple Gifts”, which was about striving for simplicity in general, but inspired by his rediscovery of tenkara. Of course, I was also thrilled when I recently browsed the Patagonia fly-fishing online catalogue and watched a video featuring big chunks of ice floating by Craig Mathews, of Blue Ribbon Flies, with Yvon yelling “iceberg!”, as Craig managed to land two beautiful trout in frigid waters. 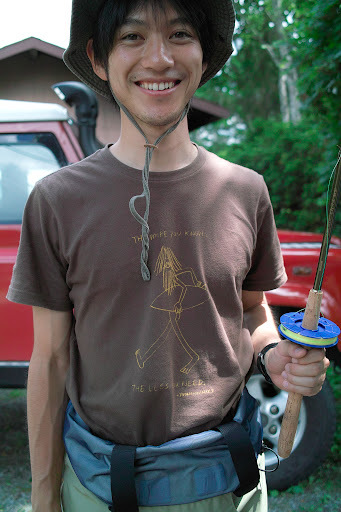 Now, through fate, or something else, I was invited to help teach a tenkara class to the “Patagonia Tenkara Club – Japan”, as I near the end of a 2-month trip to Japan, where I came to learn more about tenkara. The members of the Patagonia store met this morning at the Mt. Ontake minshuku (type of hotel). This was the second time Patagonia staff members came to take lessons with my sensei, Dr. Hisao Ishigaki. Dr. Ishigaki is the most prominent tenkara master in Japan. He has been my “tenkara no otto san” (tenkara father) for about 2 years, ever since we met during his first visit to fish in the US. And, though I speak little Japanese and he speaks very little English, we have managed to communicate very well over the last couple of years. By now we have fished together numerous times and he says he’s taught me all he can about tenkara – though I highly doubt that. Today was the first time we taught a class together, so I feel like I have graduated. Dr. Ishigaki and Patagonia employees were first connected last year by the owner of the “Mt. Ontake” hotel, which is near the mountain bearing the same name, and pictured on today’s group photo. Mt. Ontake, the hotel, is a regular hangout for employees of Patagonia. They stay here to enjoy fly-fishing, skiing and also for sawanobori, or “shower climbing, which are abundant in this area. 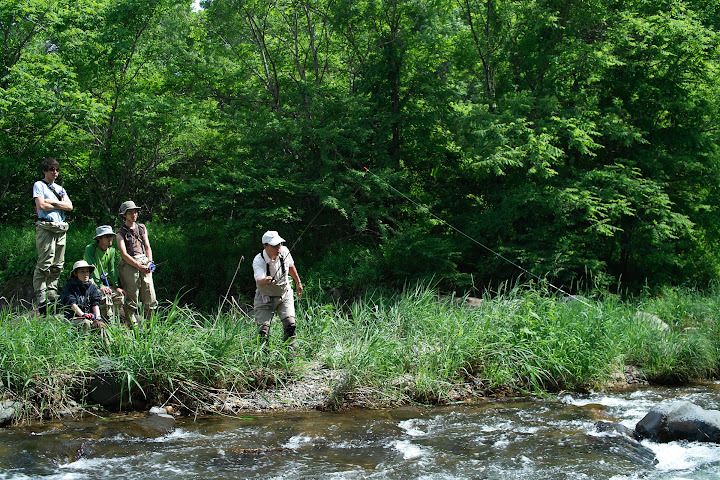 We taught the basics about tenkara, starting with the flies and knots, and moving on to a casting lesson. In the afternoon we fished three different streams nearby. As my Japanese is still not great, I focused more on the demonstrations, teaching them good casting form, and providing fishing tips. 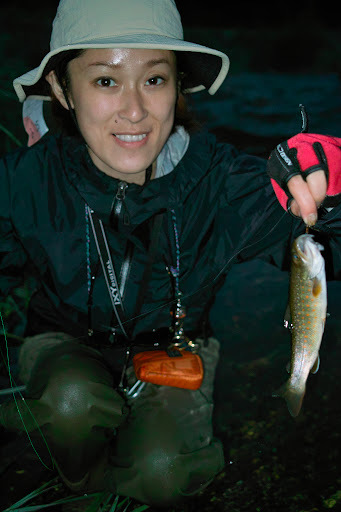 I was rewarded when “my student”, Madoka Itou, of the Kichijoji store, had a rise to her fly, the first rise of the day in the group, and then she managed to catch a beautiful iwana (char) later on. The yumazume, roughly translated as “evening activity period” (or evening hatch) was the best time of the day. The fishing had been slow until the end of the afternoon, and then things started happening. It was not a super active evening, but everyone experienced the excitement of fly-fishing – witnessing rises, casting to them and hooking the occasional fish. 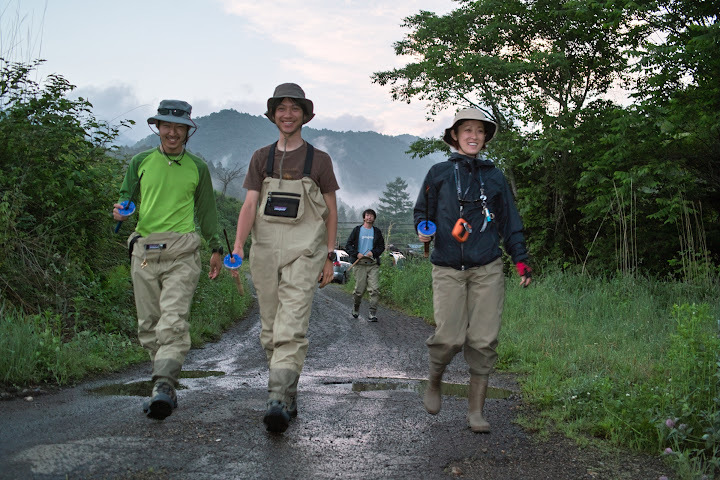 Patagonia Tokyo staff members, heading to the last stream of the day, where the evening hatch was on. “The more you know… the less you need.” – Yvon Chouinard. Oji wasn’t too sure what it meant early in the day, but I think he totally got it after the yumazume. That group photo is awesome. Is that Mt. Ontake in the background. In the photo, it looks like it’s steaming and almost erupting. What a setting! The blue tenkara line holders sure look like TenkaraUSA holders. It’s great that you’re becoming a tenkara sensei. Thanks for the continued comments! Yes, the mountain on the background is Ontake-san, a very impressive mountain. I’d love to go back there at different seasons, skiing, fishing, leaves changing colors, etc.